This machine is suitable for shoes, purses, mobile phone cover leather products PVC, pu, natural leather, artificial leather, cloth and other materials, the use of hot melt adhesive automatic gluing and folding operations. 1. The machine is controlled by low voltage current and single chip microcomputer, and the whole working process is intelligentized by the combination of good mechanical technology. 2. The machine adopts hot melt adhesive and can also fold edges of glued pieces. 3. Through the photosensitive resistor to control the glue automatically, the glue quantity is stable and accurate. 4. 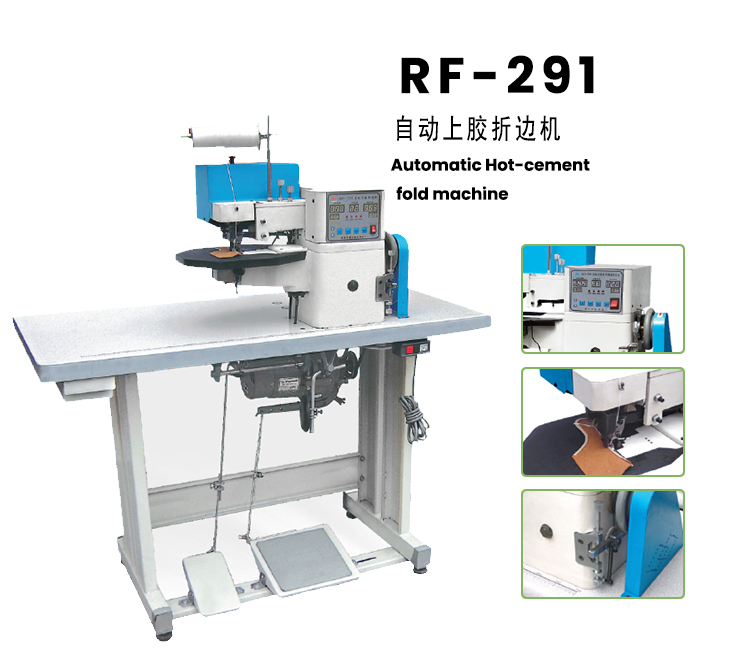 The machine has the function of self-fixed gear cutting, the new-type folding device and the pressure-guiding device. 5. The new speed regulating mechanism is convenient to regulate speed and its efficiency is 6-8 times higher than that of manual control. This machine is suitable for folding and flanging of leather bags and vamps.